Summer iPhone cases protect your phone and add warm-weather style! Celebrate the arrival of summer with watermelon cases, bright pastels, and soft floral patterns. Our new summer iPhone cases just dropped and they area full of designs that’ll fit right in at your next pool party, summer road trip, or picnic in the park. Many of these new cases are available for the Samsung Galaxy S8 and S8+ too! Warm days call for warm colors from our Summer Boardwalk cases (shown at the top). 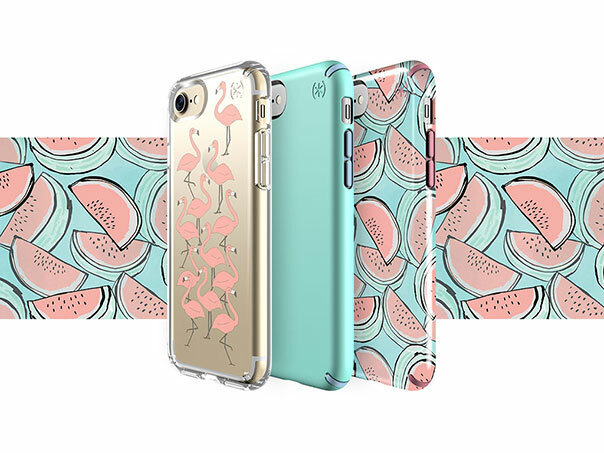 Sink your teeth into juicy watermelon with our Watermelon Patch Presidio INKED case that protects against drops up to 10 feet while looking great. The Flashy Flamingos Presidio CLEAR + PRINT case shows off your phone and adds personality with a flock of flamingos. Protective pastels on our Aloe Green/Periwinkle Blue cases add bright color to your phone and offer superior slim protection. No need to max out your vacation days for a relaxing retreat with these subtle pink, gold, and grey tones. Soft flowers on the Organza Bloom Presidio INKED iPhone 7 Plus case and the Dream Catcher Presidio CLEAR + PRINT case for iPhone 7, iPhone 7 Plus, Samsung Galaxy S8, and S8+ take you on a trip to the desert without needing to hit the road. Wherever you go on this season, these summer iPhone cases have your back with up to 10-foot drop protection. Celebrate blooming flowers with Speck’s Garden Picnic cases. Sophisticated floral patterns on the Aqua Bouquet Presidio INKED and Chalky Floral Presidio CLEAR + PRINT cases let you take the garden with you wherever you go. Add a dash of purple to your look with the soft lavender of our Bellflower Purple/Ash Grey Presidio case. Light and dark aqua tones on the Robin Egg Blue/Tide Blue Presidio GRIP case make it look fresh for spring. Speck’s Spring and Summer iPhone cases are available now for iPhone 7, iPhone 7 Plus, Samsung Galaxy S8 & S8+. Shop them at speckproducts.com.